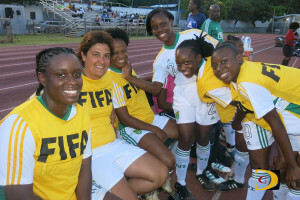 The U.S. Virgin Islands’ Zola Kaza lodged a hat trick during Sunday night Women’s football friendly match with the BVI at the A. O. Shirley Recreation Grounds, which was played as one of the events marking the BVI Football Association’s 40th Anniversary activities. Seven minutes into the game, Kaza found the nets for a 1-0 lead, which they carried into half time. Then four minutes into second half, Kaza split the BVI’s defense again to give her team a 2-0 advantage, after placing the ball past the arms of outstretched goalie Brittney Peters. In the 58th minute, Kaza completed her hat trick when she fired from 25 yards out on her right side as the ball flew past Peters for the 3-0 advantage. The BVI couldn’t capitalize on its chances and squandered it’s last opportunity three minutes before the end of regulation when Mackiesh Taylor—the USVI’s last defender—got her foot on the ball when three of her opponents were setting up a play. BVI coach Charlie Jackson said they played as well as they could and achieved one of their goals—holding their head high and show they can play the sport. USVI player-Coach Mackiesha Taylor said it was a great game and the focus was on winning. Although they haven’t played in a while Taylor said the chemistry is still there. Among other things, she said they could build on shooting because they missed a lot of goals. Connecting more, making better passes, shot composition and concentrating she said are areas to improve as some players just kicked the ball when under pressure. Jackson said they approached the game with a 4-3-2-1 tactical formation, which was designed primarily to get them to a different level as they have been playing a 4-4-2, which is a basic version of Football. The plan he said was to get them passing, moving and understanding how to move forward in a quick transition. On Sunday, the BVI hosts St. Vincent and the Grenadines at 5 p.m. in a Men’s friendly.